I’m getting really irritated with my lack of Nature Knowledge. I come from farming and water-gypsy stock (my mum’s side), and I really ought to know better. With that in mind, I now sally forth with mobile, poo-bags, puppy bribes and a flower book. I look like a tinker, my pockets bulge so much. The new flower I find today is Garlic Mustard, which apparently has an aggressive habit. I immediately imagine it swathed in starched black and white, marching forth against beautiful, feckless bluebells. It has other names – Jack In The Hedge (presumably with Jill), Hedge Garlic, Sauce Alone (Sleep Alone, too, I should think). 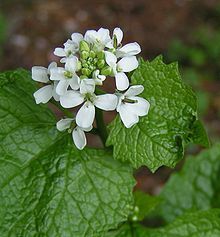 Garlic Mustard has tiny white flowers made of four petals in a sort of Maltese Cross. They cluster together at the end of long stalks, and their leaves look rather like glossy nettle leaves. The dogs and I are walking up The Clump, and the plant is thick under the newly-green hawthorns. I pick some to roll between my finger and thumb – my flower book says it should smell and taste garlicky. My sense of smell is hopeless, and I don’t want to eat it as it’s the perfect height for a peeing Labrador. Apparently, people eat it in salads, and I think of my great-grandmother, ruling the world from the stern of her boat, sending my grandmother off to forage. Farmers remove it from cows’ fields, as it taints the cows’ milk with garlic (handy, though, I should’ve thought, for bagna cauda). I’m also advised it’s excellent for white butterflies, who lay their eggs beneath the leaves. It’s this thought that puts me off. Popping butterfly eggs between my teeth. The thought makes me grimace all the way home, my lower lip turned down in a way I know to be unattractive, but simply can’t control. Pop. Shudder. I wimp out of the Garlic Mustard in our salad, and poke the lot through the wire to the Chickarockers. They gobble it down in a minute, crooning, then looking at me in expectation. ‘Maybe tomorrow,’ I say, remembering, too late, the problem it causes in cows. Heya Katie – sorry! It’s so silly, isn’t it? I grow all of my own lettuce and spinach, and have probably eaten a ton of bugs, but somehow the butterfly eggs thing totally put me off the garlic mustard! I know what you mean. I grew up in the country, and I live in the country now (just put in my lettuces and spinach – here’s hopping my family of fat rabbits keep to the patch I planted for them. . . such a pushover) but I have to admit squeamishness. I loved the post and the line – thank you! !